EXPERIENCE THE LIMITS OF SEEING an art and science panel, part of Cambridge Science Festival. Continuing Visualise’s exploration of the boundaries of inner and outer space we invite all to the second ART AND SCIENCE CIRCLE: a starry, thought-provoking, fun, interactive, public discussion on The Limits of Seeing, on THURSDAY 22nd MARCH at 7.30 pm, LAB 028, Anglia Ruskin University. 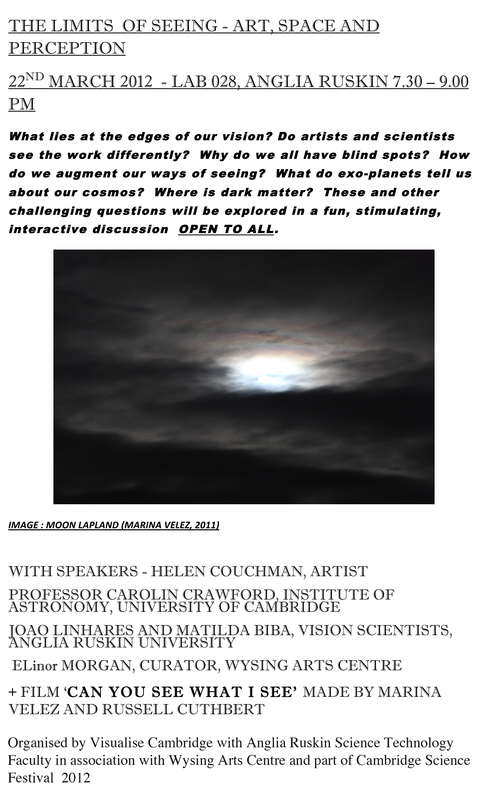 With Professor Carolin Crawford, Institute of Astronomy Cambridge; Elinor Morgan, Curator Wysing Arts; Helen Couchman, Artist; Joao Linhares and Matilda Biba, Vision Scientists, Anglia Ruskin University; plus ‘Can You See what I See?’ a new video made specially for the event by Marina Velez and Russell Cuthbert. Don’t miss !! 7.30-9.00 pm. Free event. In association with Cambridge Science Festival, Anglia Ruskin Science and Technology Faculty and Wysing Arts Centre. Helen Couchman (born UK) has exhibited widely, both in the United Kingdom and internationally. Her first book, WORKERS 工人, June 2008 was exhibited in London and in Hong Kong and will be shown in April 2012 for the first time in Beijing. It takes the form of a series of portraits of the men and women who laboured to build the Olympic park for the 2008 Beijing Olympics. Her second book, Mrs. West’s Hats (2009) consists of sixty self-portraits, referencing her maternal grandmother, whose splendidly eccentric collection of hats Couchman wears in the photographs. Later works include Untitled (Collecting and Dropping) (2009) Cloud series, Yellow lining (2010) and In Beijing (2011). These works address in part her negotiations with the city of Beijing where she has now worked for six years. She now lives in Beijing and in London. More at www.helencouchman.com. Joao will be accompanied by his colleague in Anglia Ruskin Vision and Hearing Sciences, Matilda O’Neill-Biba, MCOptom, who has a degree in Optometry and Vision Sciences in 2002 from City University, London where she is now undertaking research and currently in the final stages of her PhD. She is also a visiting lecturer on the MSc Diabetic module, City University. Her research interests include acquired visual function and colour vision loss in subjects with ocular and systemic conditions (ARMD, Diabetes, MS and Glaucoma); new colour vision and congenital colour vision deficiency and assessment. Most important astronomical observatories are placed in high altitude locations such as the Atacama Desert, the Andes or Hawaii, where visibility is optimal as they are situated above clouds, water vapour and other atmospheric elements. However, scientists working in these observatories have to deal with physical and psychological high altitude related medical problems. When discoveries are made at these sites, assuring scientific rigour is paramount. This is normally achieved through a series of cognitive tests that measure both accuracy and speed of thinking, conducted between the scientists in the observatory and those based at sea level. This tension between what it is gained in vision and what may be lost in understanding highlights the idea that we do not necessarily see only with our eyes, but rather with our brains and our consciousness. This video work uses a poetic and minimal language to express the problematics of achieving universal understanding of concepts and suggests that this process is both visual and verbal. It explores the limits of vision through communication and understanding that is simultaneously inwards and outwards, subjective and objective.